Individuals with anxiety and related repetitive behaviors often qualify for more than one such diagnosis, or they may present with a singular set of symptoms that does not clearly fall into any one diagnostic category (e.g., Tourettic OCD, perfectionism). By shifting away from a categorical approach to viewing psychopathology, the purpose of this presentation is to increase understanding of the commonalities in diagnosis and treatment among anxiety, obsessions/compulsions, tics, hairpulling, skin-picking, and autism. The utility of understanding these relationships will be discussed, including application of key treatment principles that cut across diagnostic categories. 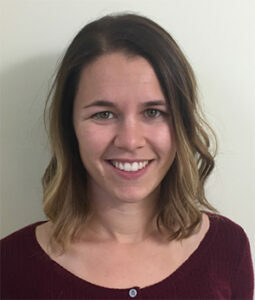 Kathryn Roberts, Ph.D. is a post-doctoral fellow at the University of Pennsylvania’s Child and Adolescent OCD, Tic, Trich, and Anxiety Group (COTTAGe). Dr. Roberts specializes in the assessment and treatment of child anxiety and related repetitive behaviors. She has particular interest in mechanisms that underlie the co-occurrence of such presentations and has performed EEG and fMRI research to understand neural correlates associated with these presentations. Dr. Roberts has presented her research at professional conferences, including the Association for Behavioral and Cognitive Therapies and the Society for Psychophysiological Research, and has been published in journals like Psychophysiology and Biological Psychology. Dr. Roberts received her bachelor’s degree from The College of William and Mary and her doctorate in clinical psychology from the University of Delaware, completing her clinical internship at Massachusetts General Hospital/Harvard Medical School. Are intrusive thoughts considered OCD? If so, then suggestions please on how to help my son with learning to manage the intrusive thoughts. Many people, with or without anxiety or OCD, experience intrusive thoughts. The extent to which these intrusive thoughts become “sticky” in the brain, and lead to subsequent interference in their life, can inform whether or not treatment is recommended. OCD refers to the specific pattern where an individual experiences an intrusive thought (e.g., I could get sick!) or feeling (e.g., I am disgusted by the thought of germs on me), which makes them feel anxious or uncomfortable, and they subsequently engage in a behavior (called a compulsion; e.g., I must wash my hands right away!) to alleviate that uncomfortable feeling. Because the compulsion quickly takes away the discomfort and causes a huge sense of relief, the next time the individual has that intrusive thought or feeling, he/she runs to the compulsion even more quickly. In other words, the relief reinforces the process of the person engaging with the compulsion. The core components of evidence-based Exposure/Response Prevention treatment for OCD are: 1) exposure to feelings of discomfort – to help individuals tolerate, and importantly, to continue to function, despite intrusive thoughts or feelings, and 2) response prevention – not engaging in the compulsion that interferes with functioning and fuels the return of more obsessions. Instead, if the intrusive thoughts you see in your son are not immediately followed by a behavior that gets rid of the thoughts, the thoughts might not be subsumed within OCD. They may instead be considered anxious thoughts (e.g., if they are about something negative that happened in the past that keeps coming to mind). For these, it may be helpful to have your child categorize intrusive anxious thoughts as “something” or “nothing” thoughts, depending on whether it’s something productive to worry about (e.g., an upcoming test) or not productive to worry about (e.g., the time I didn’t make the baseball team). “Something” worries can then be problem-solved. Noticing “nothing” thoughts, but then moving attention to something more meaningful is useful for “nothing” thoughts. If there are patterns to recurrent thoughts, such as if thoughts are from same content area, it will also be important to make sure your child is leaning into his discomforts, rather than avoiding the things he fears. How do you distinguish between OCD, Tics or sensory issues especially when the child refuses to do something he has done before? This is a great question and one I hear often! Psychological disorders are considered to be a product of both biological vulnerability (e.g., genes) and environmental stressors. Therefore, it is possible that something that was once easier for the child may now be more difficult. To help break down what may be going on, it can be helpful to consider the antecedents (i.e., what comes before) and consequences (i.e., what comes after) of the behavior. In terms of antecedents, are there particular situations in which the behavior is occurring? Perhaps patterns will help you determine that something is hard for your child in a certain place or at a certain time of day, so that you can help problem-solve what is contributing to making behaviors manifest more under those conditions. In terms of consequences, is the child getting any reinforcement for the behavior at all, such as parent attention or getting out of doing something they didn’t want to do)? Consequences can keep behaviors coming back as well. In addition to helping resolve the concern, understanding antecedents and consequences can also provide diagnostic clarity (e.g., is there an intrusive thought or feeling that precedes the compulsive behavior; is there a tactile/auditory discomfort that precedes the sensory avoidance). How can parents recognize anxiety as a real problem and better advocate for services in the school? Like the lungs and heart, the brain is another organ in our body that sometimes doesn’t function at its prime. What you raise is a good point – anxiety is something that everyone experiences – and it is useful in many situations to help keep us safe – so at what point do we consider it problematic? Where anxiety is considered problematic is when fears start to cause us to avoid situations that we used to enjoy or in which we need to engage (e.g., school). To advocate for formal services in the school, the child would should obtain a psychological evaluation to assess their difficulties and determine supports that would be helpful for them. The school will then use this to formulate a 504 Plan or IEP for your child. Appreciate your comments on this situation – We have a middle school child with High functioning Asperger’s. Last year we saw OCD such as repeatedly touching ends of walls /furniture, head neck movement, repetition of words. It seemed to have stopped for the past year with no intervention. I am concerned that it will return upon entering middle school. During development, and particularly in individuals with vulnerabilities for anxiety and related repetitive behaviors (..and ASD appears to have some overlaps with this), many individuals go through a singular period or two of obsessions and compulsions – and then obsessions/compulsions don’t return, or return in less interfering ways. Since the obsessions/compulsions you described resolved on their own and without intervention for your son, and the symptoms did not worsen through repeatedly doing compulsions as they typically do in individuals with OCD, I am hopeful that your child’s symptoms might fall into this group. For other individuals, a large stress like returning to school can increase obsessions/compulsions. In this case, it can be helpful to prepare as much as possible, alerting him/her to the tendency to engage with compulsions and instead helping him to instead lean into his discomfort. My son is 19 and he is displaying Anxiety and OCD tendencies. He is in college doing well. He sees a counselor but he is paralyzed sometimes because of his fears and anxiety. Would appreciate your comments on this. If your son is paralyzed by fears and anxiety, it seems like this may be an area your son and his counselor might directly want to target in treatment. Cognitive-behavioral therapy (CBT), which most importantly includes gradually exposing you son to the things that he fears, is currently the most effective treatment for anxiety. CBT for anxiety and Exposure/Response Prevention (EX/RP) treatment for OCD are complementary treatments, meaning that they both involve helping your son gradually learn to tolerate and lean into his discomforts. Congrats to him on his successes in college! Rumination- is that like being occasionally kept awake at night with things you can’t stop thinking about. When does that become a problem? Rumination refers to cyclical thinking about different aspects of a situation that is upsetting to us. We can also think of it as “going down the rabbit hole” with a thought, where the continued focus of it in your mind leads you to continue being upset. You’re exactly right – bedtime is a common time that people ruminate! There aren’t other things to distract them easily from worrisome thoughts in their mind. Rumination becomes problematic when it start to negatively impact your life (e.g., can’t fall asleep as easily, can’t be mentally present in various parts of your day) or mood, as extended thinking about negative situations certainly doesn’t make us feel better! Regarding your description of tourettic OCD, is that usually treated or just acknowledged and/or recognized? Great question! Tourettic OCD isn’t a formal diagnosis in the DSM-V but rather describes a certain subsect of OCD – and it is certainly treatable! Treatment components for tics (stimulus control, competing responses) are often incorporated with the treatment for OCD (exposure, response prevention) for Tourettic OCD. Does a generalized anxiety diagnosis imply that an individual would become anxious over a broad range of things and not 1 or 2 things specifically? You are correct – generalized anxiety refers to worries that cross a range of content areas. I will note that even individuals diagnosed with GAD might have one or two worries that cause the most interference in their life, but there are other, smaller worries. Generalized anxiety may also grab onto different aspects of a person’s environment as they arise. If a person has one or two specific fears that cause interference in their life, and no other notable fears or worries, these may be considered phobias or a different anxiety disorder (e.g., social anxiety, separation anxiety). Is it typical for generalized anxiety disorder to express itself with outbursts of anger? Anxiety shows its presence in many ways – and yes, anger is one. Particularly if someone is asked to confront something that they feel anxious about, anger is a common expression of their desire to avoid the anxiety-provoking situation.